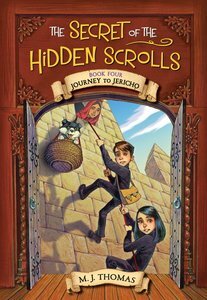 The Secret of the Hidden Scrolls series follows siblings Peter and Mary and their dog, Hank, as they discover ancient scrolls that transport them back to key moments in biblical history. In this fourth adventure, the time-traveling trio journeys to an ancient desert and finds the Israelites preparing to enter the Promised Land. With limited time to solve the secret of the scroll, Peter and Mary join Israelite spies on a reconnaissance mission to Jericho; sneak Rahab to safety; and ultimately face the scheming man in black as the walls of the city begin to crumble. Fans of the series will love this whirlwind adventure that brings the Bible to life. About "Journey to Jericho (#04 in The Secret Of The Hidden Scrolls Series)"